Welcome back. If you remember last week, we talked about our armor, our spiritual armor and how important it is to keep on. We talked about the parts of armor and the uses of some of those parts and what they meant. Today we will talk about them again, but this time I will ask you about them. While doing this lesson I sought to know more about it, then I originally thought so I hope you will be able to get something out of it too. Today we will go deeper than maybe you are used to, just hold on, we will understand it. Are you ready? > Again, we will be studying this as an in-depth Bible Study. > What does this verse mean for us? As we begin to study this, I will be using different pieces from different authors and teachers to teach this. If I do it from all of me to all of you, we will get deep but we want to be deeper still. > This will be our 2nd class, we have one hour under us but we want to continue to know why it’s important we wear this armor continually. > We are breaking down what the Full Armor of God is and why it’s important. 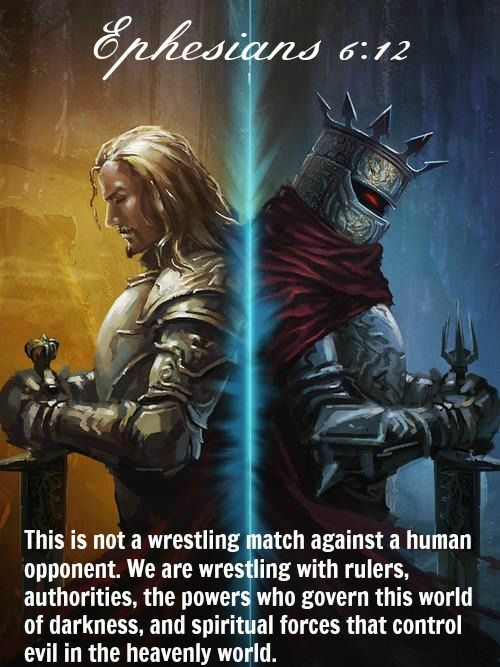 > We will pray at the end of each class for the things that we need broken off of us so we can wear our armor proudly and without false pride but with pride that we walk with the Lord closely. Lord Jesus, help us to understand the things of the spiritual nature, the spiritual realm and the reason we need to know what we are reading. Lord open our spiritual eyes to see those things from you and how we will use our armor better. Lord, we learned some but we want to go deeper with you, we want to walk in the depths of your glory, we want to esteem you and acknowledge that you are our God. We desire your heart and desire to walk with you. We love you and thank you for what you have done and will do for us. In Jesus’ name, Amen. 10 Finally, my brethren, be strong in the Lord and in the power of His might. 11 Put on the whole armor of God, that you may be able to stand against the wiles of the devil. 12 For we do not wrestle against flesh and blood, but against principalities, against powers, against the rulers of the darkness of this age, [a] against spiritual hosts of wickedness in the heavenly places. 13 Therefore take up the whole armor of God, that you may be able to withstand in the evil day, and having done all, to stand. We looked at our helmet and how important that is. Let’s look at the word wrestle. What comes to your mind about this word? Because the devil likes to mess with our thoughts, dreams, visions and our mind. We must take control of our thoughts and not allow unbelief or negativity come in and steal the joy and the beauty of our life. What do you think? What sticks out to you? What are the things that are your most pressing problem or a person or people that are on your list of problems or circumstances beyond your control? List them in your notes. Put asterisks at the ones that you are wrestling with. Why do you think you are wrestling with them? Emotionally, physically, financially, or verbally. Let’s look at what is happening with them. Let’s dig a bit deeper into some of those. He goes on to say: Not against flesh and blood - Not with people. The apostle does not mean to say that Christians had no enemies among men that opposed them, but they were exposed often to fiery persecution; nor that they had nothing to contend with in the carnal and corrupt leanings of their nature, which was true of them then as it is now; but that their main controversy was with the invisible spirits of wickedness that sought to destroy them. They were the source and origin of all their spiritual conflicts, and with them the warfare was to be maintained. 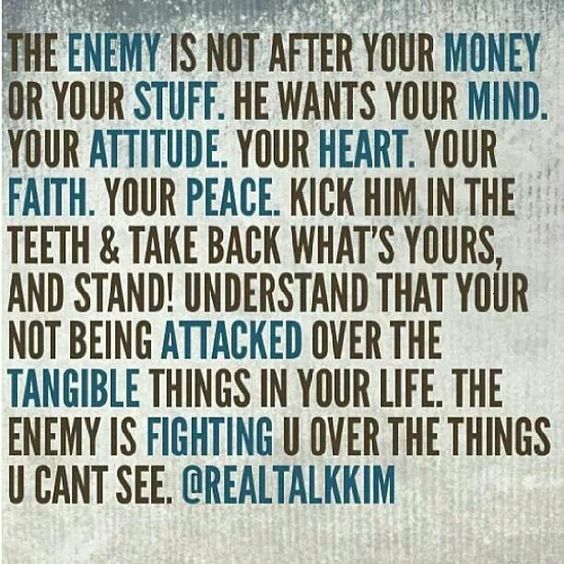 So some of what you are going through is not against you personally but fighting the spiritual battle that surrounds you. Who is your real enemy here? It’s not God, it’s an adversary the Devil who roams from to and fro, trying to destroy what he deems necessary. That is the things on your list are easy for him to come in and take priority in our thinking about them. “But against principalities - There can be no doubt whatever that the apostle alludes here to evil spirits. Like good angels, they were regarded as divided into ranks and orders, and were supposed to be under the control of one mighty leader; see the notes on Ephesians 1:21. It is probable that the allusion here is to the ranks and orders which they sustained before their fall, something like which they may still retain. The word "principalities" refers to principal rulers, or chieftains. So, let’s look at this a bit closer. This was not my intent on this lesson but really in order to really understand the reason for our armor. It’s going to get a bit deeper than what my own intention was, but I believe as I write this, it’s where the Lord desires us in our walk. Against the rulers of the darkness of this world - The rulers that preside over the regions of ignorance and sin with which the earth abounds. "Darkness" is an emblem of ignorance, misery, and sin; and no description could be more accurate than that of representing these malignant spirits as ruling over a dark world. The earth - dark, and wretched and ignorant, and sinful - is just such a dominion as they would choose, or as they would cause; and the degradation and woe of the pagan world are just such as foul and malignant spirits would delight in. It is a wide and a powerful empire. It has been consolidated by ages. It is sustained by all the authority of law; by all the omnipotence of the perverted religious principle; by all the reverence for antiquity; by all the power of selfish, corrupt, and base passions. No empire has been so extended, or has continued so long, as that empire of darkness; and nothing on earth is so difficult to destroy. (5) with the wickedness of the pagan world - the sins of benighted nations - also a part of that kingdom. Wherever we come in contact with evil - whether in our own hearts or elsewhere - there we are to make war. Let’s go back to what we have on for our armor: We have a helmet, we have a breast plate, we have shod for our feet and shins, we have armor on our arms. But there is one thing that isn’t covered, what is it? There is no armor for our back! Why? Because we are not to turn our backs on HIM. We are to stay in the fight and not turn away because it’s hard, that is when the devil will come in and kill us. Can you think of a time when you have turned your back in Him? Now why would the devil attack your mind? Why would he even care about it? Because your own mind can destroy you through stinkin thinkin. This is the main part of his tactic. If he can get into your mind, he can destroy your relationship with the Lord. 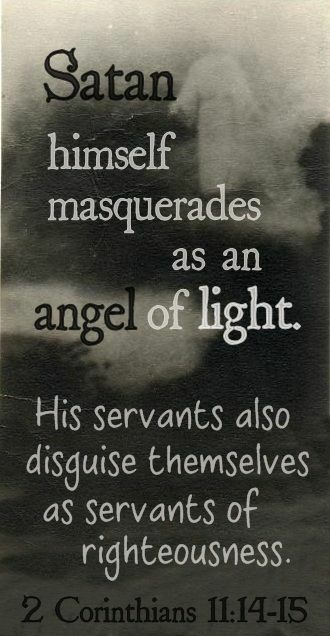 The enemy’s approach is sneaky and secret, keeping his ways very hidden and we almost forget that he is even around because we can not see him, but if we look really close at our lives, we can see the things that are from God and not from God. We don’t look close enough to see his snares, his trip ups, his efforts to destroy us at every step. This Meany wants to take back what he feels God took. But God didn’t take it, when we gave our life to Jesus, we gave Jesus permission to be joined in our lives. Well, the devil is jealous and envious of the joy that Jesus gives, he wants it back. Let’s look at 2 Cor. 11:14 and see what this sneaky creep is up to. Your salvation is an ongoing process, it's not something that is done once and we forget about it. It's an ongoing, ever changing, always progressing process. Let’s change the subject for a second. Let’s look at your life. What are you hopes and dreams? Let’s take a few minutes and write them down. Now what are your hopes and dreams for your children? One of my son’s dreams was to fly around the world delivering food to the nations that needed it, including the U.S. Well, as he grew older and more defiant to the teaching of Jesus, the devil waltzed right in and took that dream and the other dreams and visions he had because the door was opened wide with disobedience to his mom and disobedience to the Lord. His life today is definitely not what God had intended, though we know God can turn something bad into something good if WE are ready to submit to Him. God wants us to be prosperous and to be rich in HIS glory but also there is so much available for us and to us. Moreover, if you have the vision and goals, you can see the devil clearer in your line of vision and you can stop him from stealing it. Now let's look at your past, no judgment, just write down on that list what was good and what was not so good? Now, let's look at again and write the results of those things and let's see if God's hand was upon you during those times. We are going to be searching for the deeper things of God but also his adversary the devil. If you look at this and say to yourself, how is the devil going to steal this? What are you thinking? If we water down the Gospel, God’s Holy Word, it does not equip us. We will be like the world and the devil isn’t going to mess with us that bad. But if we stick to what the Word of God says, we will fight for every minute step, every inch of ground, every tip toe, every millimeter of ground. The Armor of God has been given to us by our God, our Commander in Chief; laid out before us as a tool to protect and defend! They are disciplines that we should be actively doing DAILY! God is calling His army, His body, His followers, to fight against the evil one! 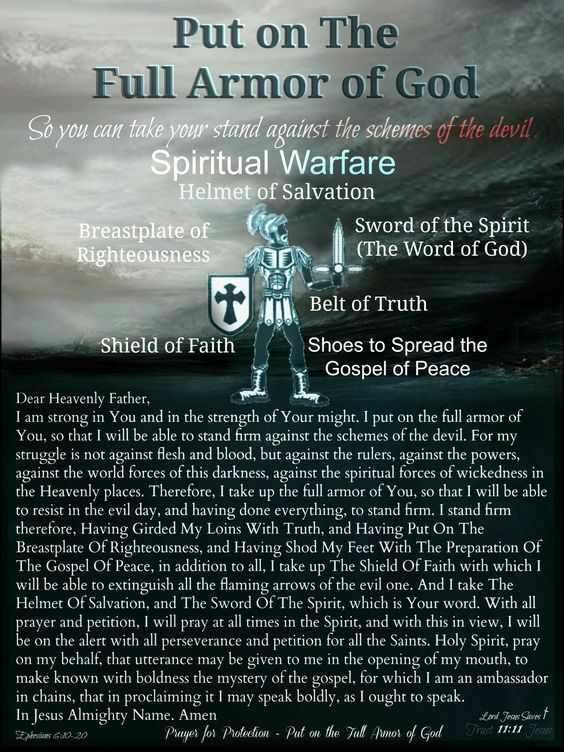 Will you PUT on the FULL Armor of God? We are going to take a look at a study that we teach and how it affects us when the devil comes knocking and finds us home and unguarded. How many of us are buffeted by the devil? How many of us call out to the Lord to come and help? You know he’s always there even when we get hit hard. So, let’s take a look at this. Excerpt taken from page 3 of Biblical Foundations of Freedom by Art Mathias. But I want to share this prayer with you. You can use this as well. Let's pray that junk off and take back what the devil stole. He is a creep and he is a stealer, he will blindside you faster than anything. Dear Heavenly Father, in the name of Jesus, we give you permission to try our hearts for any wicked way and we covenant with you that when you need to reveal a wicked way (anything that grieves the Lords' heart), and we covenant with you that when you reveal a wicked way we will deal with it in forgiveness and repentance. we set aside this time for you and ask that the Holy Spirit be in charge and and In the Name of Jesus, we bind all evil spirits and command them not to interfere. Amen. Dear Heavenly Father, In the name of Jesus, I ask you to forgive me for (any of the things above- one at a time) __________________. I purpose and choose to forgive myself and release myself from (same as above). In the name of Jesus and by the power of His blood, I cancel Satan's power and authority over me in this issue of ________________________ because God has forgiven me and I have forgiven myself. Dear Heavenly Father, in the name of the LORD Jesus, I ask you to forgive me and I purpose and choose to forgive myself for allowing the accusing spirits to come in. I release myself from all of them. In the name of Jesus. I cancel all Satan's power and authority over me for any and all entry points. God has forgiven me and I have forgiven myself. It is done and over with. In the name of Jesus I command the principality of these accusing spirits and all of their army to leave me now! Holy Spirit, please come tell me your truth and heal my heart and mind. Everyone else gets what he or she wants. I never get what I want. When is it going to be my turn? I'm going to make the best of what I've got. In the name of Jesus. I cancel all Satan's power and authority over me for any and all entry points. God has forgiven me and I have forgiven myself. It is done and over with. In the name of Jesus I command the principality of these words and warfare and all of their army to leave me now! Almighty God, in the name of our Lord and Savior, Jesus Christ, I put on Your full armor today. As I continue in my daily union with You, I trust that I will continue to walk in Your righteousness, being led by the Holy Spirit and praying completely in faith, covered by Your divine protection. I declare that whatever is thrown at me, I will stand strong, by the Word of God deep within my heart and soul, and by Your grace. You are faithful, Abba Father, and I know that all things work together for good to those who love You and are called according to Your purpose. No weapon formed against me shall prosper and every tongue that rises up in judgement, I will prove to be in the wrong, in the name of my sweet and loving Jesus! Thank You, merciful Father, that I am blessed beyond measure and am protected fully by You. My heart overflows with praise and gratitude for all You’ve done for me. Thank You, most gracious and everlasting Father! In Jesus’ matchless name, I thank You for the opportunity to put on Your armor daily. So be it… Amen and Amen!